We are located within a one hour drive from many of the most beautiful places to visit in north-eastern Iceland. Hagi is very well located for sightseeing in the north. Locations such as Lake Mývatn (36km), Jökulsárgljúfur National Park (90km) with Dettifoss and Ásbyrgi are all close by as well as the whale watching capital of the North, Húsavík (26km). 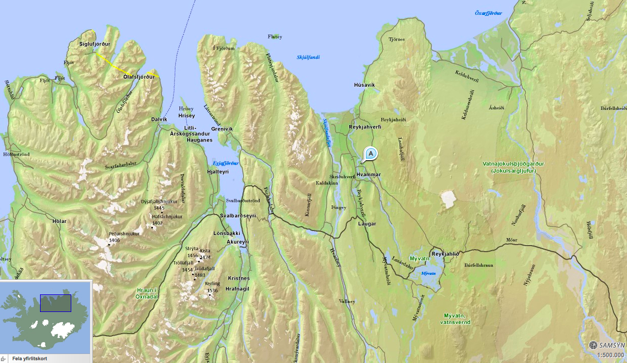 Nearby are also Grenjaðarstaðar Museum and Laxárgljúfur Canyon and hydropower station. Hagi is located 26km from Húsavík, 76km from Akureyri and 35km from Lake Mývatn on road 853. Arriving from Akureyri you turn left from road 1 to road 845. Then you drive for 10 minutes and turn right at road 853. If you are arriving from Lake Mývatn you drive road 87 from Reykjahlíð, turn left at road 853.